These Dr. Seuss listening activities are ready to use for Read Across America week. Let's celebrate Dr. Seuss's Birthday by listening to some of our favorite books! 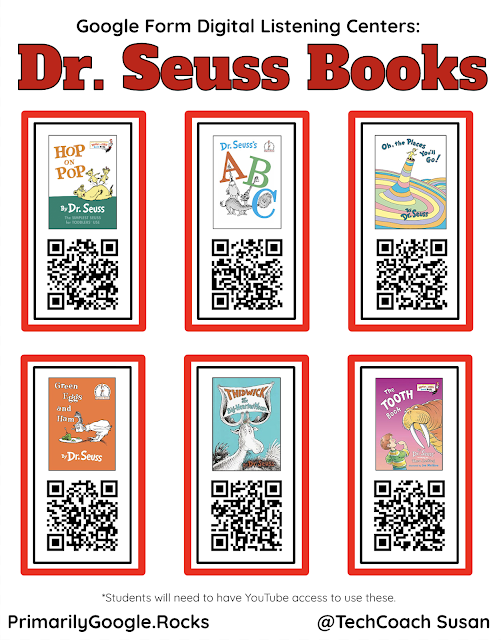 Print the QR codes or share the links to your students. Get a printable file here! Centers or learning stations are so important in the primary grades! They provide students with opportunities to practice skills either independently or with peers in small groups. Also, this is often a time when the teacher has an opportunity to work with small groups or individual students for the purpose of meeting their unique learning needs. These Digital Listening Center Activities created in Google Forms are PERFECT for center or station time! They give students an opportunity to hear a wide variety of texts being read aloud. Students are exposed to language and literature while practicing essential listening skills. Even early and non-readers can enjoy texts being read aloud by fluent models. Google Form Digital Listening Centers can be shared with students in Google Classroom or any other way you share a link to your students. These activities DO NOT require students to be signed in to their own Google Account, but they will need to have access to YouTube. I like sharing YouTube videos through Google Forms this way because the young students can view the YouTube content without going to an actual YouTube page. I love YouTube, but it does have a lot of distractions and questionable content, especially when it comes to our littlest of learners! 1) Paste this link in Google Classroom. Students can view the video and vote. OR 2) Make a copy of the file to be able to edit. Add questions and see your class results! 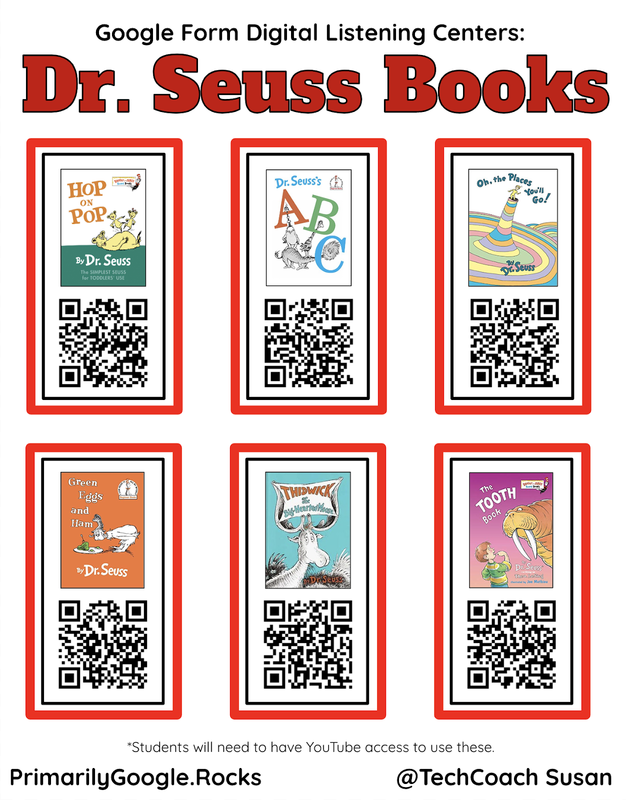 The QR codes and short links above will take your students to my copy of the Form, which will allow students to watch the YouTube videos embedded in the Form, while also giving them a chance to cast a vote as to whether or not they liked the book. A summary of overall votes will be accessible after the Form has been submitted. You may also use the additional links to make your own copy of these Google Forms! By doing this, you'll have access to your own students' votes, as well as have an opportunity to customize the Form by adding questions of your own! One example might be that you may want to add a question to collect your students' names, or have them choose their name from a list so you know who completed the activity! Also, if you have older students, you may want to include short response or reflection questions. 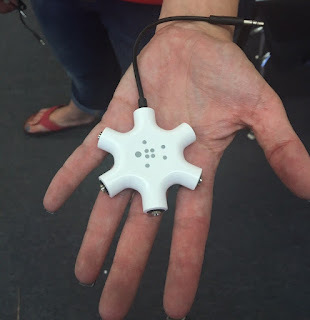 If you have a limited number of devices, use a headphone splitter such as this one I found on Amazon so small groups of students can listen to the stories together on one device! Learn how to make these and other great Google activities for young learners in the Primarily Google Online Course with EdTechTeam Online! How do you have it set up so they don't have to log into their Google account? Presidents' Day Resources for Little Learners!